I already wrote about how badly Terrible’s breakfast buffet sucked, but with a ton of points to spend we’ve already been back twice for free lunches. Here’s the deal with Terrible’s, and the reason we can’t stay away. Every day apart from Thursday and Sunday (which are double point days) you can get a $5 gift card to spend at their gas stations (in fact it looks like they will work at any Chevron pump) with every 1000 points earned – PLUS you get to keep the points. One point is awarded for every $1 pumped through a machine. 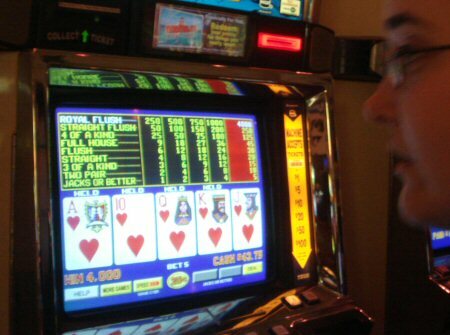 They have 9/6 jacks-or-better video poker, which is a 99.5% payback and so with every $1000 played, your expected loss is $5 and the gas card freebie makes it a break-even game. We’ll use a lot of gas this trip so it’s just as good as money. The Jeep may have to be swapped before we go anywhere outside the valley, as there’s a very peculiar leak that seems to be coming from the air conditioner. It gets wet under the passenger side mat as well as dripping onto the ground after stopping – quite a worry for a vehicle that’s only 500 miles old. After the free gas, you still get to spend your points. That same 1000 points is worth just over $3 at the cafe or $5 in the gift shop. I already blew some on a shirt, a bottle of Jim Beam and some tickets to see George Wallace. The buffet though is the best value by miles. Breakfast is just 250 points, lunch 350 and dinner 500. We could already eat there for the next three weeks for free – if we wanted to. A $14 bottle of my mate Jim – yes, that’s about 7 quid – was 2800 points. A bargain if we paid for it and even better for free, but the same points would be worth five dinner buffets – if we could ever possibly eat that many! George Wallace was 2000 points for 2 tickets, worth (apparently) $87 each. I don’t expect anyone ever pays full price, but it’s still a pretty sweet deal. Lunch really isn’t too bad, if you don’t expect the same spread you’d get for $19.95 at the Bellagio. It’s pretty much canteen food, functional and nothing special. There’s a taco station, some kind of pasta or spaghetti, some kind of stewed meat and a salad bar. If there were pizza slices it would be perfect, but it’s still absolutely fine to keep you going through to dinner! Remember, we’re here for four weeks – it doesn’t have to be prime rib and shrimp every day! So am I winning so far? Nope. But Claire is more than making up for it. "Can I have a jack of hearts please", she turned to me and asked. "OK", I said, pretending to do a jedi mind trick to the machine. Water dripping under the car from the aircon at rest is fine. Water dripping under the passenger side mat? Less so.